As with any wireless network out there, the main purpose is the provide access to services (data, voice, etc.) The services network is divided into Public Switched Telephone Network (PSTN) that provides voice and special telephone related services (look it up on wiki), and the internet, which provides a wide range of packet data services such as email or access to the world wide web. These things are probably all sounding very familiar to you, and they should, because they are critical in maintaining today’s society, and almost everyone living in the modern world uses at least one of these services sometimes in their daily lives. 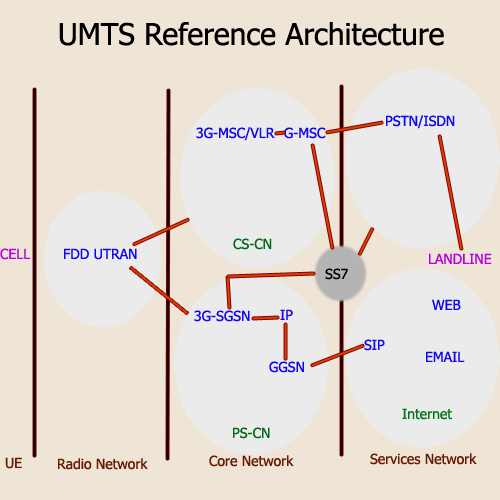 The UMTS mobile, also known as the User Equipment (UE), interfaces with the UTRAN via the UMTS physical layer radio interface. In addition to radio access, the UE provides the subscriber with access to services and profile information. For example, the cell phone you carry in your pocket is the UE (user equipment) that interfaces with the cell phone towers that companies like Verizon, AT&T, and Sprint provide for you. In UMTS, there are two Core Network (CN) configurations, the Circuit Switched CN (CS-CN) and Packet Switched CN (PS-CN). The CS-CN is based on the GSM Public Land Mobile Network (PLMN) and provides functions such as connectivity to the PSTN, circuit telephony services such as voice, and supplementary services such as call forwarding, call waiting, etc. The PS-CN is based on the GSM General Packet Radio System (GPRS) PLMN, which provides access to the Internet and other packet data services. Both core networks connect to the UMTS Terrestrial Radio Access Network. The UTRAN has two options for its air interface operations. One option is Time Division Duplex (TDD), which makes use of a single 5 MHz carrier for communication between the UE and the UTRAN. The other option is the Frequency Division Duplex (FDD), which provides full duplex operation using 5 MHz of spectrum in each direction to and from the UTRAN. The following articles in the wireless communication systems section focus on the operations and design aspects of the UTRAN in FDD mode. How do all of these components fit together? Check out the image below. The UTRAN consists of one or more Radio Network Subsystems (RNS). An RNS consists of one Radio Network Controller (RNC) and several Nodes. The radio network controller and the nodes are two essential components of UTRAN. Apart from these two component types, UTRAN requires Operation Maintenance Centers (OMC) to perform Operation Administration and Maintenance (OA&M) functionality on the nodes and RNCs. Yes, I know the acronyms are getting a little out of hand, but it is essential to learn them if you want to speak the language! Engineers only speak to each other with acronyms and it is very very annoying indeed. Nodes: Within this network, a node is the radio transmission and reception unit within UTRAN (remember above, I explained that the UE is your cell phone you carry in your pocket). It handles radio transmission and reception for multiple cells within a coverage area. So if you think about the amount of area that a certain cell tower (cell) can transmit its signal with the proper quality of service (QoS), you can get a mental grasp on multiple cells being in one coverage area, say if the towers are close together. The node implements CDMA-Specific functionality such as encoding, interleaving, spreading, scrambling & modulation. The nodes are also what used to be known as the Base Transceiver Subsystems (BTS) in second generation systems.